Home » Zero Accidents and 100 % Value Added. Utopian – Challenging – Natch? Zero Accidents and 100 % Value Added. Utopian – Challenging – Natch? Occupational health and safety and process efficiency are outstanding action items in coal mining. At first glance, the goals like risk minimization for the employees and steadily rising productivity, seem to stand in opposition to each other, specifically taking into account the potentially higher risk in underground mining. History shows that different approaches, i.e. various management systems have been used to achieve these goals. Experiences in recent years show that an integrated, systemic approach with close interaction provides even greater efficiency and effectiveness in both areas. Zero accidents and waste-free processes, representing 100 % added value, are no longer an utopia but targets that can be considered as realistic. Six factors play the main role for success, which will be achieved with altered behavior and mind-set of the staff and the management, in connection with a profound change in corporate culture. The paper is based on the authors’ presentation on the Aachen International Mining Symposium (AIMS) at 27th May 2015. Are 100 % added value and zero accidents in companies, especially the coal mining industry utopian visions, realistic challenges or already daily routines taken for granted? This question will be looked at from two angles which at a first glance seem to have only few things in common and are even contradictory in their aims: increase of productivity at the cost of safety at work or loss of efficiency in favour of safety at work? On the one hand the aim for maximum safety at work in all processes, that means no risks to employees at any time. On the other hand maximum efficiency in processes, that means not allowing any losses or waste in any process. This applies to production as well as administration. RAG Aktiengesellschaft (RAG), Herne/Germany, has many years of experience in optimising these two areas. The development of the German hard coal mining industry is characterised by technical and organisational changes which means that management systems also have to be adapted continually to the changed framework conditions. With these developments the mining industry does not differ from other industries. The management systems include approaches and methods in order to achieve defined aims in the company. In order to understand the current aims of the RAG it is helpful to look back at the developments of the last decades. The mining industry in Germany has changed dramatically but this also applies to other countries. Technology, mechanisation and automation are the keywords which characterise this development. The essential entrepreneurial drive lies in the aim to continually increase the companies productivity. In parallel to this the demands increased due to the change of the deposits: increasing depths of up to 1,600m in connection with negative impacts of the climate and the rock pressure conditions found below ground. The expansion of the mine buildings, due to the development of mines in terms of area, has increased significantly. Long transport, drive and discharge routes are the results of this development. The complexity of these processes and their interdependencies and influences have increased significantly and not linear to the development of depth and area of the mines but exponentially. The causes are manifold – for example the concentration of point of operation, the expansion of the mine building, die increase of depth, developments in technology and production processes. These are just a few reasons out of a large spectrum. Here lies the cause for the introduction, continual adaption and change of the management systems as the ‘tools’ for management. Conservative, hierarchical management structures of the first phase of the development in the mining industries did not satisfy the demands that were made on mastering the complex company structures and processes. An adaption process followed as a result. This talk focusses management systems for safety at work and productivity. A management system is an instrument for the systematic implementation of corporate objectives, that means a system representing a dynamic network of design principles, methods and tools for planning, for operations and permanent process improvements in the company. These management systems are to show structures and methods as helping tools in order to standardize processes and behaviour and thereby make them comprehensible and transferrable but also evaluable and optimizable. The aim of safety at work is to totally avoid risks to employees in all processes below ground as well as above ground and to prevent accidents. This task is embedded in the company’s self-image and greatly exceeds the legal requirements. Safety at work has always been very important to the RAG but it was only at the beginning of the 90s that a mission statement was developed in which safety and production were expressed as equal corporate objectives. The expression of a change of paradigm represented a strong hierachical impulse which had a significant impact on organisation and process design. 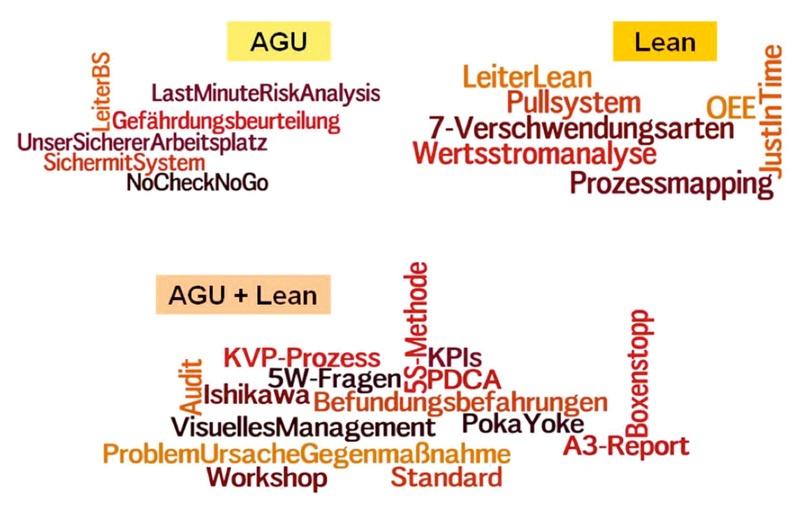 Under the logo ‘AGU = Arbeits-, Gesundheit- und Umweltschutz’ (= Occupational Safety, Health and Environmental Protection) the system has been continually developed during the last years and has found company wide spread, profile and acceptance at the RAG (Figure 1). Safety at work is an integral part of planning and operations. The required resources are provided for the processing of safety topics. Processes and responsibilities are fully documented. A comprehensive reporting system which reaches all levels of the hierarchy is kept up-to-date. Making use of all possible communication channels for safety at work. The maxim is always that all employees should be able return home and finally go into their retirement as healthy as they were when they took up work in the company. The target is therefore the physical intactness of the employees – zero accidents. Lean Processing or Lean for short is the name of the management system to increase efficiency at the RAG since 2001. The principles and ideas of this management system are based on and originate from the automobile industry, from Toyota. Creating value without waste is the all important maxim of Lean managements worldwide. To put it in a nutshell, the aim of Lean is to leave everything out that doesn’t serve the creation of added value and eliminating any kind of waste. This applies to all core, management and support processes in the company. Five central principles form the foundations of Lean. They are universally applicable but have to be adjusted to the differences in the processes of various industries. Thus, one could describe RAG’s Lean Processing program as Lean Mining. Creating values for the customer, that means processes without waste. Always look at the whole value stream and not only at elements thereof. Where possible organise activities in a synchronised flow. The customer initiates the process (pull principle). Continuous search for perfection, in other words establishing a continuous improvement process. Avoiding risks and eliminating waste are the different aims of the company. 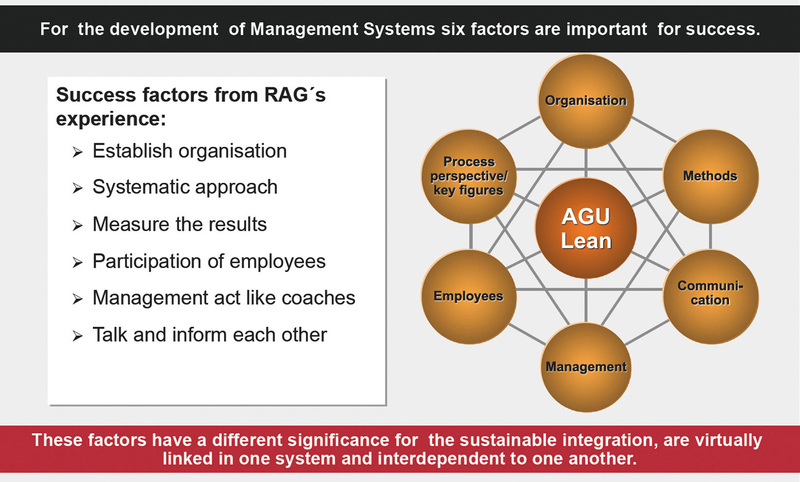 It could therefore be assumed that the building blocks and success factors of the management systems with which these aims are to be achieved – AGU and Lean – differ from one another. One may dare to hypothesize that both management systems have no or only a few things in common and do therefore require a different approach. The following shows that this is not the case. The development of management systems if always connected with specific corporate objectives that are supposed to be achieved with the implementation of the management systems. In this context it should be noted that the introduction of a management system alone is no guarantee for being successful in sustainably achieving these aims. It begs the question when is the introduction of management systems successful or which factors led to the failure when unsuccessful? Six success factors can be pointed out from RAG’s experience. These factors have a different significance for the sustainable integration, are virtually linked in one system and interdependent to one another. Achieving the aims is usually at risk if one of these factors is neglected during introduction, development and stabilisation of a management system in the company (Figure 2). Systemic process improvement is no sure-fire success, it needs experts and supporters who are trained in the required methods. They must be qualified and embedded in the organisation and work like internal business consultants. They train managers and employees, accompany improvement initiatives, workshops, working groups and are available as contact persons with knowledge on Lean methods. In addition, gremiums and team meetings must be established in which the implementation of Lean is organised, structured and further developed. 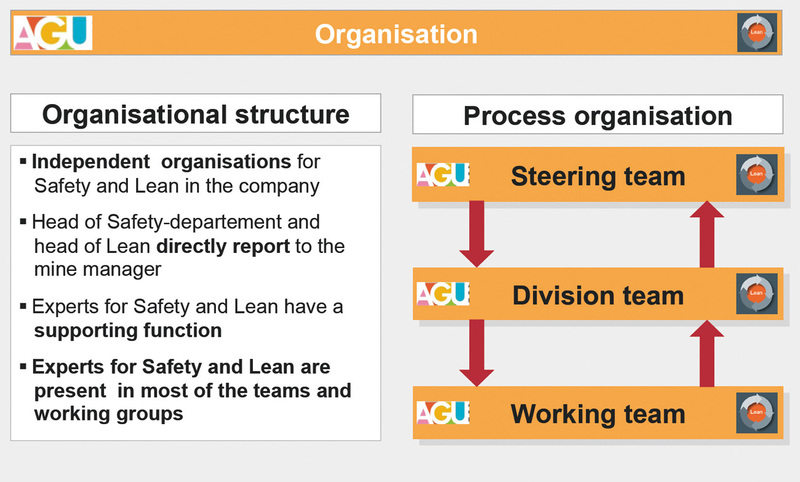 This structure and process organisation is more or less the ‘architecture’ of the Lean management system. But the development in safety at works, beside legal duties, also shows the necessity of an adequate organisational embedding. Experts in safety at work – specialists and safety officers – live the management system and develop it continuously. The organizational unit workforce protection is responsible for this. This structure organisation puts AGU at eye level with production, maintenance and logistics. It should be emphasized, that these ‘experts’ for safety at work or Lean are understood to be consultants. They are not responsible for safety at work and the process improvement in the operations but for the organisation and further development of management systems. This distribution of tasks and competence is of special importance when working together with the management. When establishing structures for discussions it could be seen very quickly that a joint handling of both topics lead to significant synergy effects. For this reason the structure of discussion groups has been changed in such a way that experts from safety at work as well as from Lean are present. Therefore, for the employees and the management the processing comes from one single source (Figure 3). The second success factor of safety at work that has emerged is the systematic, analytic approach with standardised methods and tools. A look back at the development at RAG shows a great change in the applied approach. To begin with the analysis of accidents in hindsight plays a decisive role. These findings were used to develop measures to prevent such events in future and have found operational implementation. This reactive approach was more and more replaced by an approach directed at the future in terms of a proactive approach. Today’s aim is not to allow risks to develop, whatever kind they are. Introducing the right measures, assumes that problems have been recognised and understood. Only when the real cause for a problem or risk has been analysed can effective measures be implemented. Risk analyses with regard to workplace and operating processes are required by law. This documentation forms the basis for regular information and instruction of all employees. Visual management at the workplace, systematic prevention of possible risks by means of technical or organisational measures, training building blocks for the recognition of potential risks are only a few of the elements from a comprehensive tool kit for methods and tools. These elements are components of a continual improvement process. There are a lot of methods that are always mentioned in connection with Lean. 5S-method, SMED (single minute exchange of die), PDCA-control circuit, value stream design or just in time – and the list goes on. In the end, Lean in its approach is pragmatic and uses the method that supports the aim to eliminate waste from processes. This means overproduction, waiting times, inappropriate processing, unnecessary transport, movements and inventory or defects and correction (Figure 4). The methods and tools of Lean and AGU could be described as the ‘craftsmanship’ of management systems, that have to be learned and mastered and that require a high perseverance of all employees and management that are involved. All methodical approaches result in standards for processes, for workflows, for workplace layout or for the behaviour. Self-discipline and sustainable implementation and development are the challenges that need to be mastered. A selective implementation of methods does not result in sustainable success, this applies equally to AGU as well as to Lean. 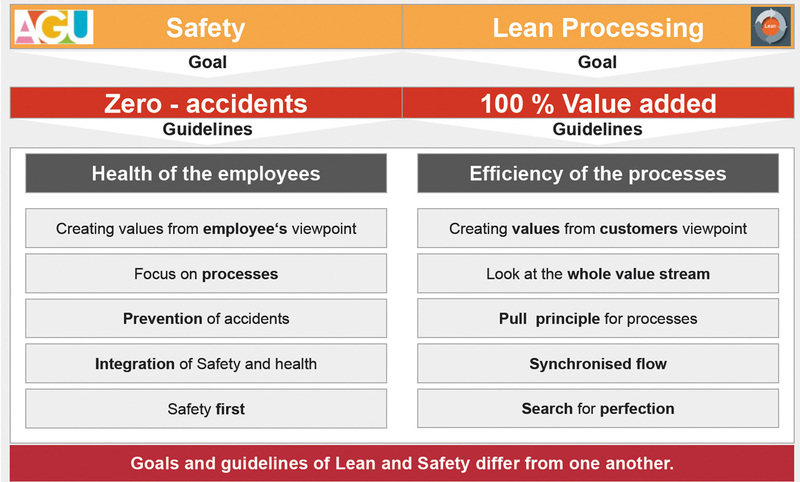 As with organisation there are also a large number of intersections of methods which can be applied similarly in the handling of Lean and safety at work. Examples are the 5 S-method, the 5-W questioning technique, SMED, die auditing or the visual management at the workplace (Figure 5). It goes without saying that it should be possible to measure these results. Cost, quality and performance are the important factors when it comes to productivity. The eyes are on the whole process in order to avoid an improvement in one area at the expense of another. Here too, there is no difference to safety at work. Documentation of accidents or events respectively, forms the basis for the development of the key figures resulting in an impressive development at the RAG. The lost time injury frequency (LTIF – number of accidents per 1m working hours) has been improved from 115 to below an impressive 5 during the last 40 years (Figure 6). This has taken the RAG now to a top position compared to other industrial branches. This development with dramatic improvements impressively reflects the benefit of the introduction and continued development of the management system. This didn’t happen by coincidence but is the result of a consistent, standardised and broadly based approach in the whole company. At this point one could get the impression that the series of success factors has come to an end. However, this theory is incorrect. In addition to the more ‘technically oriented’ elements like organization, method and key figures/process overview there are further elements of great importance that increase the complexity of the management systems but contribute significantly to the success. These are the ‘sociological’ success factors leadership, employees and communication. Good company results, that means high productivity, quality and delivery reliability but also low numbers of accidents and lowest health risks are achieved by means of good processes. Good processes are customer-oriented, economical, safe as well as optimal and fast from a safety at work point of view. 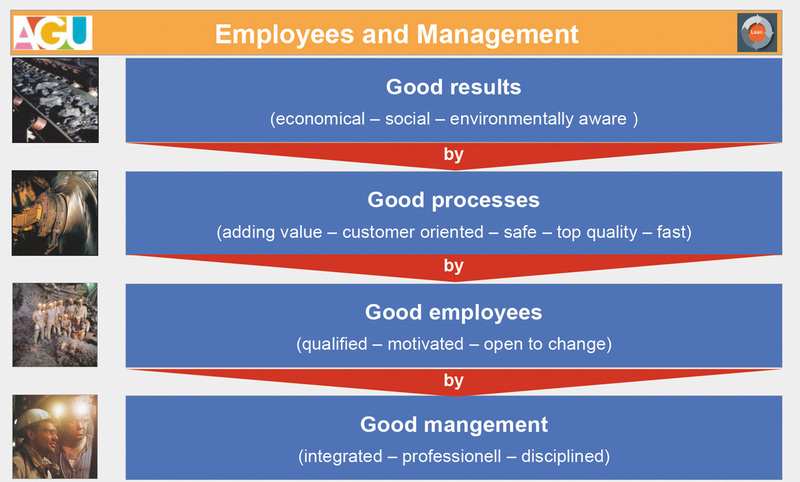 They are created by good employees and in cooperation with good management staff (Figure 7). Competent, motivated and flexible employees basically form the core of Lean. Only with successful integration of employees into the continual and systematic process optimization with the aim to eliminate waste will the utopian 100 % added value become a vision that seems ambitious but realistic. However, this assumes that employees are familiar with the Lean methods, that freedom is provided to analyze processes systematically and develop improvement measures – freedom, f. e. to participate in workshops, workgroup meetings and qualification programs. The participation of employees is based on the fundamental understanding that the employees know-how gained in their daily work in the processes should be used as expert knowledge in order to develop fast and effective solutions to problems and implement these in the operations – not selective but every day, at every location, in every process. This also applies to safety at work. The employees’ roles have changed considerably during the past years. Only 40 years ago were companies characterized by a classical-hierarchical leadership culture. The employees were moving within narrow boundaries. Safety at work was implemented by instructions and monitoring. This together with technical developments already led to a radical improvement at that stage of the corporate culture. A hierarchical intervention was able to have a positive impact. As we now know, a higher standard based on a better level that has already been achieved, requires a more intensive and better involvement of employees (Figure 8) because the hierarchical effect at this organisational phase is limited (1). Eliminating worst fault events is initially possible simply by hierarchical intervention. Once the large obstacles have been removed, success is determined by a creative involvement of each employee and later on by independently working teams of employees. From this point or respectively time on, the hierarchical effect is limited. At first, events means accident events. However, for the events of wastage in production processes it is true that a further improvement can only be achieved by comprehensive involvement of employees. The required change in corporate culture does not happen by itself but needs to be shaped actively. In addition, it is known that today more than 90 % of accidents – this means all events, even those without downtime – are due to behaviour and not down to technical shortcomings. Therefore it was necessary to aim priority measures in the prevention of accidents at organisational and personal aspects. 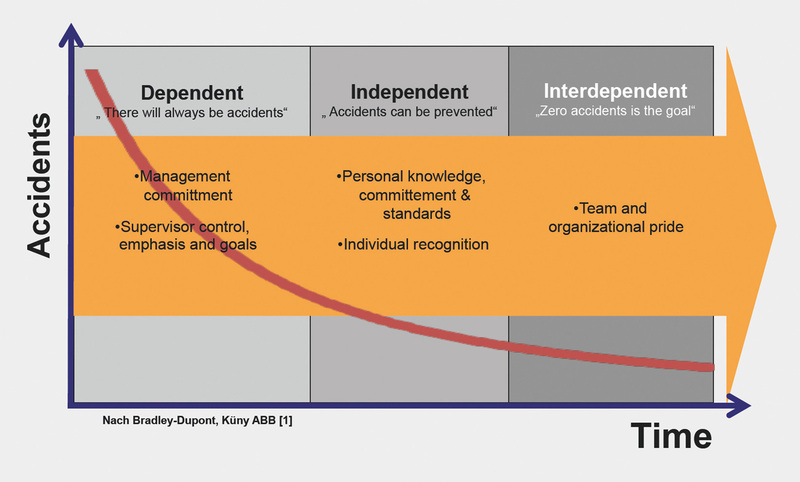 The employee’s behaviour and attitude needed to be changed in the direction ‘zero accidents is the aim’ with the challenge to continually improve. However, behaviour and attitude do not change by themselves, it is a long way with numerous waypoints. Great perseverance is needed on the part of management staff and employees. The motivation required for this is achieved by training measures for assessing risks, qualification measures, audits for safety and by praise and criticism in meetings. Joint responsibility by participation becomes an essential building block of company culture. This is the common position of successful and sustainable improvement of safety at work and Lean implementation in the company. Employees and management staff, in terms of leadership, are essential if not the essential success factor in a management system. If you succeed at both, employees and management staff, becoming enthusiastic about Lean and AGU and actively getting involved in the creation and further development then it will be more likely that ambitious targets can be achieved. It is assumed that the employees who perform these processes know them best. Of course, they will also know the problems, risks and waste that occur daily. It is therefore the task of the management staff to involve and coach the employees in a continual improvement process. Management therefore play the role of a ‘guide’ and the employees are the actual ‘core’ of the management systems. A further important success factor, the communication, rounds off the whole picture and basically forms the ‘lubricant’ of the management systems. For RAG the importance of safety at work is highlighted by a diverse, constant and targeted communication in the company, the operations and on site. Articles in the employee´s magazin, activities, exhibitions and campaign days attract attention and support the target achievement in safety at work. Of special importance are the conversations amongst employees, with specialists for safety at work and of course with management staff. 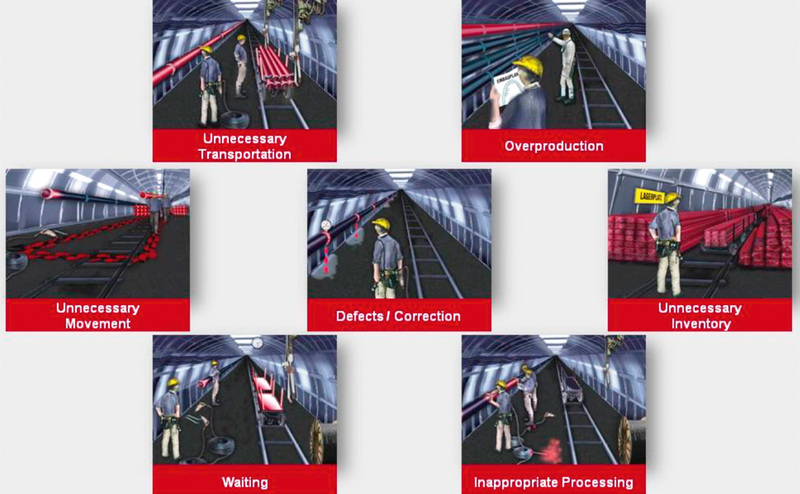 As a result, safety at works becomes routine and part of daily work and characterises the work in a team below ground as well as above ground (Figure 9). Compared with Lean it is not possible to recognise any differences, the demands on communication are fully transferrable. Lean also is about understanding the systematic process improvement as part of daily work and not regarded as an additional task parallel to the working routine. In doing so, communication is supported by different pillars. Implemented media support the ‘marketing’ of these topics in the company, i. e. the employee magazine ‘Steinkohle’, the intranet and flyers. Activities in operations, company forums, AGU and Lean days attract further attention for these topics and at the same time offer a platform for the exchange of information and good experiences. A third and the most important pillar is considered to be the personal talk between employees and management staff. Here, the subject of discussion at the work place is safety at work and process improvement and aimed specifically at the situation at the work place. The demands on the management staff cannot be assumed to be a matter of course. Training and qualification of management staff are necessary in order to make the required behaviour and necessary attitude into a routine. The whole company is ‘breathing’ Lean and safety at work. There is a deep understanding and the required mindset and behaviour can be observed in management staff and employees. Every day the whole company is learning something new in both areas and the level is increasing constantly. Improvement is daily business, occurring problems are solved quickly and sustainably. There is a culture of continual improvement. Lean and safety at work are inseparably linked. Thinking in work systems characterises team work. Orientation along the targets and the company’s strategy derived from this can be recognised in smallest process steps. Employees and management staff alike have understood this. 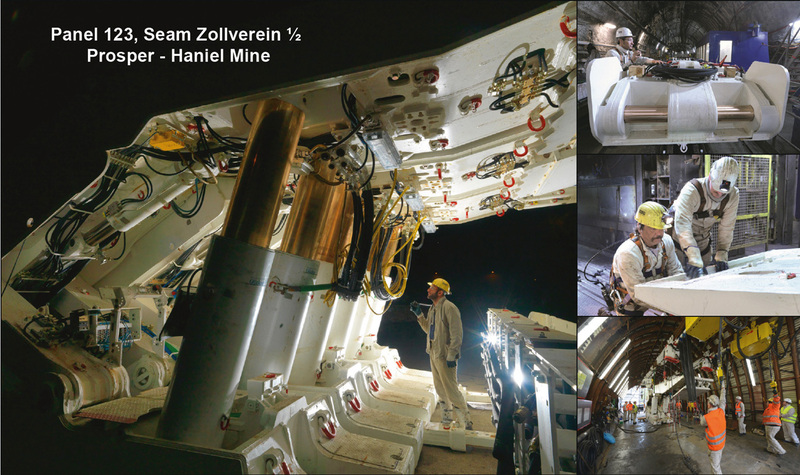 A good example from the more recent past for such an integrative approach on these subjects is the preparation of fitting and mining in the seam Zollverein at Prosper-Haniel mine (Figure 10). On a 25 meters long and realistically equipped training ground above ground, the team that would later carry out the installation and operation make itself familiar with the equipment (2). All working steps were realistically carried out and optimised several times. The results were efficient and safe working processes. The integrative handling of both topics is carefully maintained at RAG. They are at the top of the agenda in regular discussion groups and team meetings. Therefore, consistent theme-setting at all levels in the company guarantees that Lean and safety at work are not seen as a task in addition to working on planning and controlling processes but, of course, as part of it. It is this conviction that the positive effect can be seen in the development of the number of accidents during the last 10 years without being able to directly prove this reciprocal effect. The change in corporate culture has achieved a cross-fertilization of Lean and handling safety at work in terms of further development. Only a few years ago it would have been regarded as unthinkable that f. e. mining and drivage would be running without any accidents for months. These successes are not yet a matter of course but also no longer utopian. They are the result of consistent, continuous and cooperative work. Asking three questions can help understand this change. Do employees and management staff regard improvement as a firm component, work or an additional activity to the actual job? 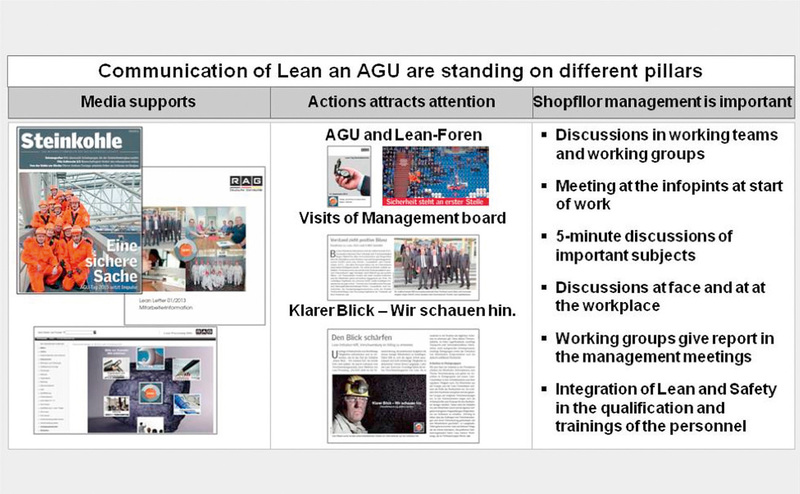 Is improvement of Lean and AGU a periodical additional product, a campaign or the central activity? Does the company accept to work on improvements only from time to time? The key to success lies in the answers to these questions. Only if you succeed in understanding process improvement as a permanent daily task – and this refers to all target figures like efficiency, quality, safety and profitability – will target situations that now seem utopian be realizable. At RAG an increase in productivity and safety at work is not contradictory. In fact, both aims and the corresponding management systems must be seen as contributions to company success. Along the company’s way with more and more difficult frame conditions it was possible to raise potentials. Initiated by the commitment to regard production and safety at work as of equal status, a change of culture from a hierarchical authoritative to an integrative leadership culture took place which nowadays allows to plan and optimize processes effectively and with the participation of employees. An open approach, the ability to work in a team, a sense of responsibility and attentiveness are an expression of this culture. As a result of this it is possible to use the employees’ knowledge as expert knowledge and to take full advantage of the success factors for optimization based on the management systems. These success factors are organization, method, process overview and key figures, as well as communication but first of all it is management and employees in a good safety culture.